This past Monday, January 25 2016 Keller Williams Bergen County Partners held its quarterly sales rally and bestowed annual awards for the 2015 sales year. It was a fantastic event, and a great way to celebrate an amazing year with colleagues and friends. The Zamir Group had a great showing, and was able to mark our best year yet. 2015 set a new standard for The Zamir Group, but 2016 will be even better. If you are thinking about buying, selling, renting, or investing – let 2016 be your year. We are hard at work, still making moves, in order to bring the very best service to our clients. Keller Williams, and our very own Town Life office, have been making great strides. It was great to celebrate these achievements with the people who made them possible. We were also honored to be recognized for a few of our own. This means that our very own Zohar had both the highest number of properties sold, as well as the highest total value of properties sold for our office last year. 2015 Culture Award for Keller Williams Town Life – Awarded to the agent who best embodies the Keller Williams spirit of giving by donating the most money to KWCares, our company charitable initiative. We are saving the best for last, as Zohar was given a truly fantastic honor in the form of one of the highest honors given by Keller Williams. Zohar was recognized with the KW Bergen County Partners 2015 Salesperson of the Year – making him the top Keller Williams agent in all of Bergen County. The Zamir Group is so honored to see our founder and leader recognized for his hard work and achievement, and thank all the Keller Williams team members who made this possible. None of this would be possible without the support of the entire Zamir Group, all of our hard-working buyer’s agents, sales specialists and support staff. Beyond that, without the amazing team at Keller Williams Town Life and all of KW’s Bergen County Partners – achievements like this would not be possible. It is by being part of such a great culture and pushed to excel by such inspiring coworkers that we are able to stand where we are today. In the end all of these awards are wonderful achievements, of which our entire team is very proud. While top salesperson for the year is amazing, nothing means more than being recognized for charitable contributions, and being part of an office that cares so much about giving back. It is only through the support of our community and our colleagues that we are able to achieve so much – for that reason giving back will always be a top priority. The Zamir Group is still selling – we aren’t going to rest on these laurels. Honors like these only come from hard work and being the best we can be for our clients. 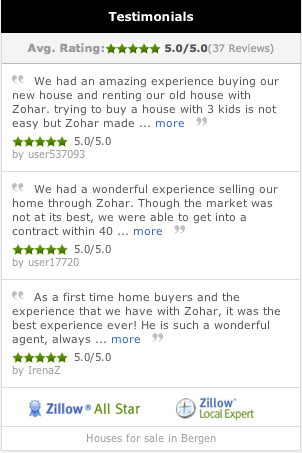 At the Zamir Group, you are hiring more than just a real estate agent – you are hiring a team and joining a family. Besides these new honors received Monday, Zohar “Zack” Zamir is a Top-Producing Broker Associate/Realtor ® and a recognized 5-Star Professional for 4 years (2013-2016) running, Accredited Buyer’s Representative® (ABR®) and Short Sales and Foreclosure Resource (SFR). Zohar is also a 2013 and 2014 NJAR® Circle of Excellence Sales Award®, PLATINUM Level. Give us a call if you want to work with Bergen County’s Premier Real Estate Group. Speak with our agents about starting or redirecting your home search today. We stand apart form the competition with a large and experienced team and our dedication to cutting edge marketing. Need more convincing? Read Our Reviews Here. Open Houses in Fair Lawn, Bergen County – Snow Can’t Stop The Zamir Group This Weekend! Open Houses This Sunday in Bergen County – The Zamir Group is in Fair Lawn and Paramus this Super Bowl Sunday!